Blackbirds can become a nuisance to many gardeners and farmers because they eat crops and their bird droppings can make for unsanitary conditions. According to the National Sunflower Association, the annual damage caused by these birds is estimated at $200 million. The birds travel in flocks that can run into the millions and even though part of their diet consists of crop-damaging insects, many people dislike them. Incorporating scare tactics and bird repellent can help you get rid of the birds. Hang scary visual devices on your property. 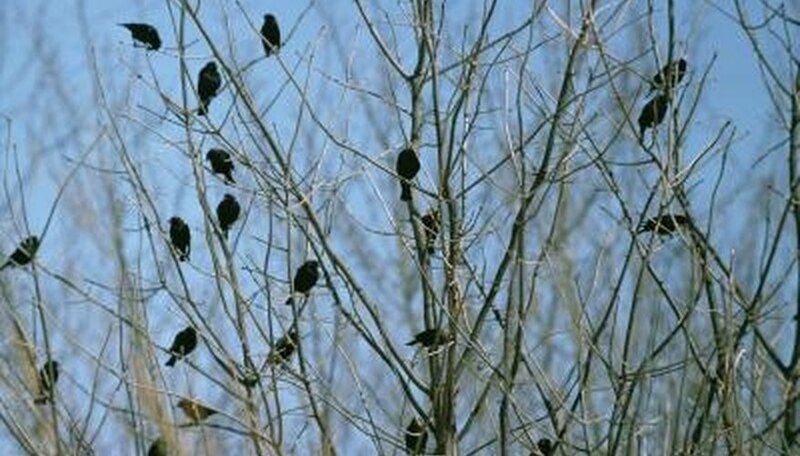 Attach reflective tape or brightly colored weather-resistant balloons to tree branches, sprinkler risers or trellises located in front of the area that the blackbirds frequent. The reflection of the tape combined with the fluttering sound it makes in the wind, or the bright colors of the balloon and its reflective material, scare away blackbirds. Treat your field with chemically-treated grain bait. When eaten by a blackbird, chemicals in the grain cause the bird to make distress calls and behave as if it is having an epileptic seizure. Its erratic behavior scares away the entire flock of blackbirds. Use a propane exploder to scare blackbirds. Propane exploders, elevated on a truck bed or barrel, release a cannon-like sound over your crops. The exploders have timers that set them off and they should be moved around the property every two to three days. The noise scares away the birds. This repel method can be compared to shooting a rifle in the air. Cover your crops with bird netting and harvest them as soon as possible. Chemically-treated grain bait is a restricted use pesticide only to be used by certified applicators. Using this product in a manner inconsistent with its labeling is against federal law. Avoid using chemically-treated grain bait if you find the killing of birds inhumane, because the bait kill the bird that ingests it.